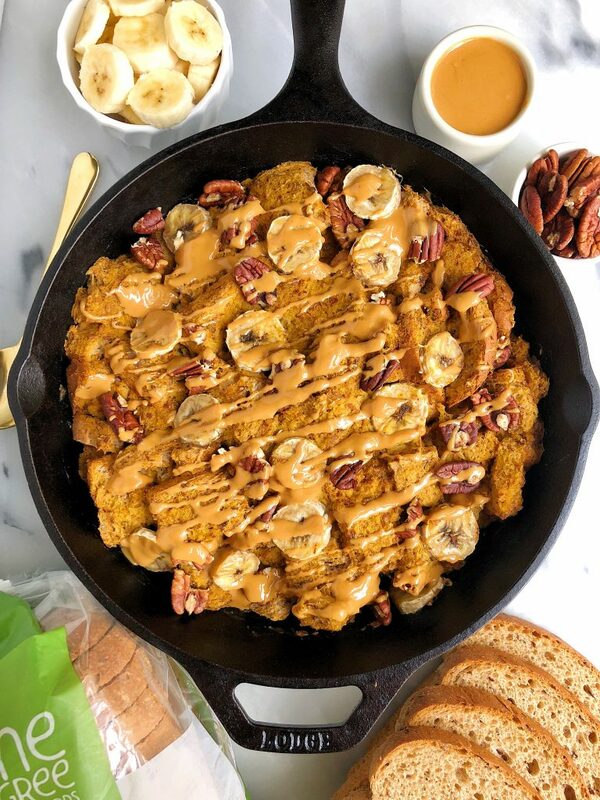 Vegan Overnight Pumpkin Banana French Toast Bake made with sprouted bread for an easy and delicious breakfast or fall brunch recipe! As if we needed a reason to love breakfast time even more. 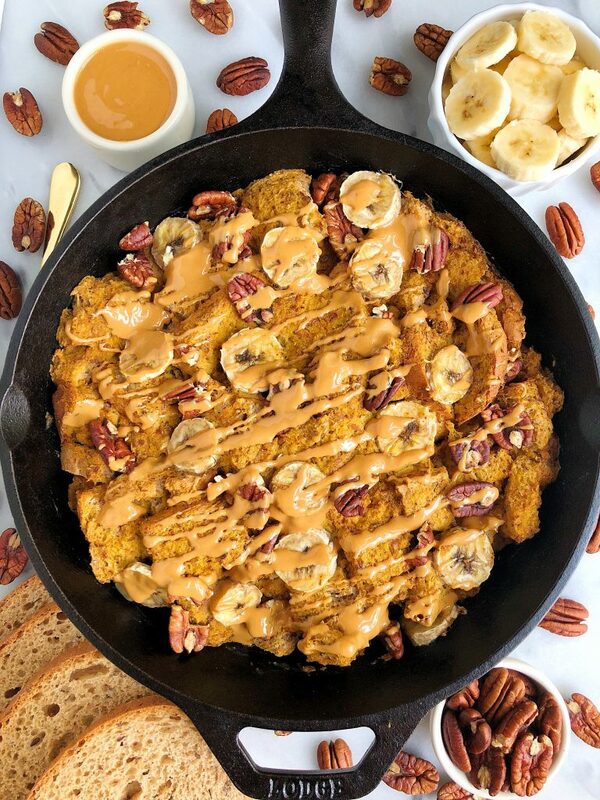 Now we have this Vegan Overnight Pumpkin Banana French Toast at our fingertips. Combining so many favorites in one recipe today. We have french toast combined with pumpkin AND banana. I like to think of this as the trifecta. It has the sweetness from the banana, fall flavor from the pumpkin and is hearty and filling thanks to the sprouted bread. You’re probably wondering why in the world this is an “overnight” french toast bake. I like to prep this the night before and bake it in the morning. That way the bread has time to marinate and absorb the liquids overnight (in the fridge!) and it makes it extra flavorful. Although that is totally optional and you can also just make a few minutes ahead of time and bake! I get a ton of questions about what kind of bread I like to use and I always say the same thing “breads made with clean ingredients, no creepy oils, flours or added sugars”. Today I am using One Degree Organic’s sprouted bread, which is one of my go-to breads. It isn’t gluten-free but it is made with all organic and sprouted ingredients like spelt, raisins and flaxseeds in their Flax and Spelt Bread. I personally do not have a gluten intolerance and I trust eating products like those from One Degree Organic. They source from quality farms and you can also source where their ingredients come from by using the barcode on the package (it is so cool!). You have been seeing a ton of One Degree recipes over the past few months. I’m still obsessing over Healthy Vegan Carrot Cake Loaf, Mini Vegan Chocolate Chip Banana Bread Loaves and Dark Chocolate Tahini Blondies. 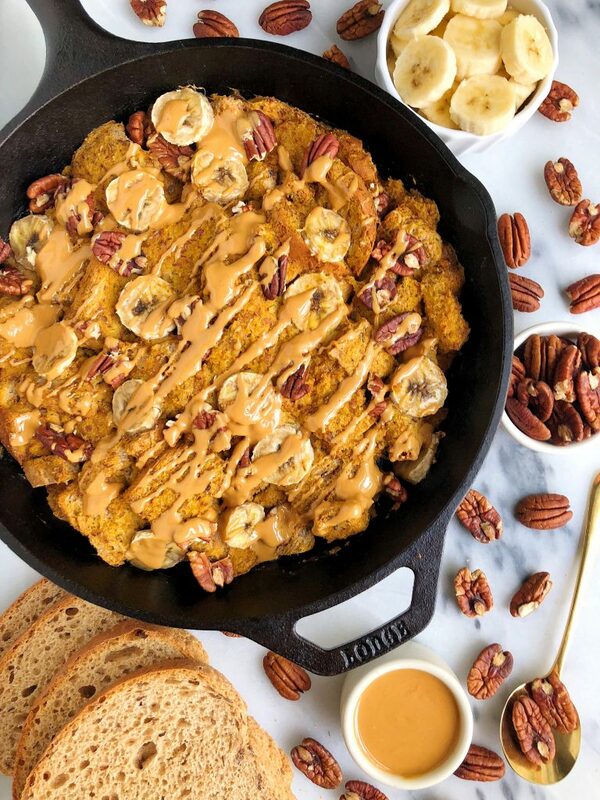 Don’t forget to share this Vegan Overnight Pumpkin Banana French Toast with me on Instagram when you make it too! I cannot wait to hear what you think. If you leave the skillet in the fridge overnight, bake for 35-40 minutes at 350 degrees next morning and serve! Thank you One Degree Organic for sponsoring this post! It means so much to me to partner with brands I love and believe in! Do you bake the dish covered or uncovered? Based on the directions above, the baking length and temp are the same no matter the dish temperature. Is that correct? I was thinking it would need to cook longer if cold verses room temp.